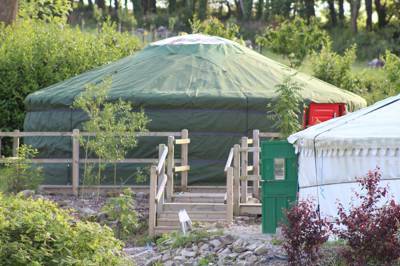 The traditional (standard) yurt is a large yurt with one king size bed and two double beds, sleeping up to six people . It’s been a tumultuous existence for the Fir Hill Estate. Established in the 16th-century, built up in the 19th century and then abandoned less than a hundred years later, it is only in the last decade that people have begun to rejuvenate its wild and untamed space. Today’s owner, Charlie Hoblyn, has been tirelessly restoring the grounds to craft what is now a managed yet natural 60 acres. It’s like an estate-sized version of The Secret Garden – a hidden treasure being slowly brought back to life. 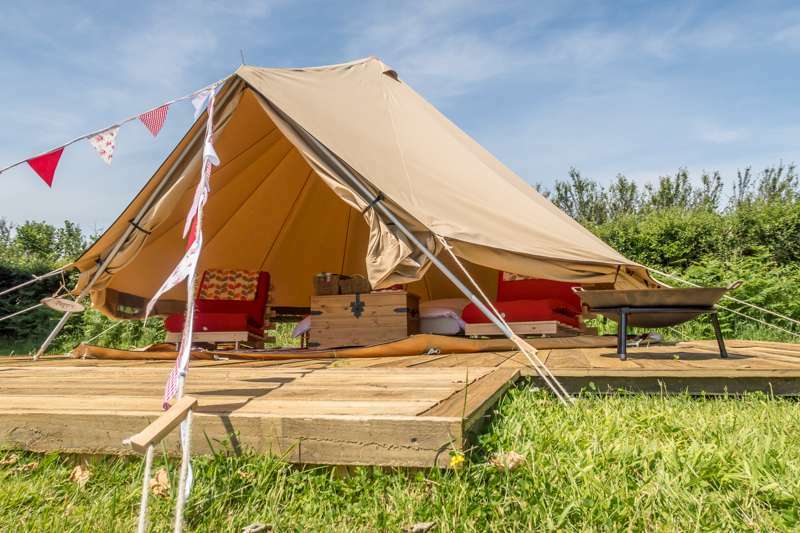 In amongst the shrubbery and meadow space of the old Fir Hill farmland, is the estate’s 21st-century venture – a North Cornwall glamping hideout. 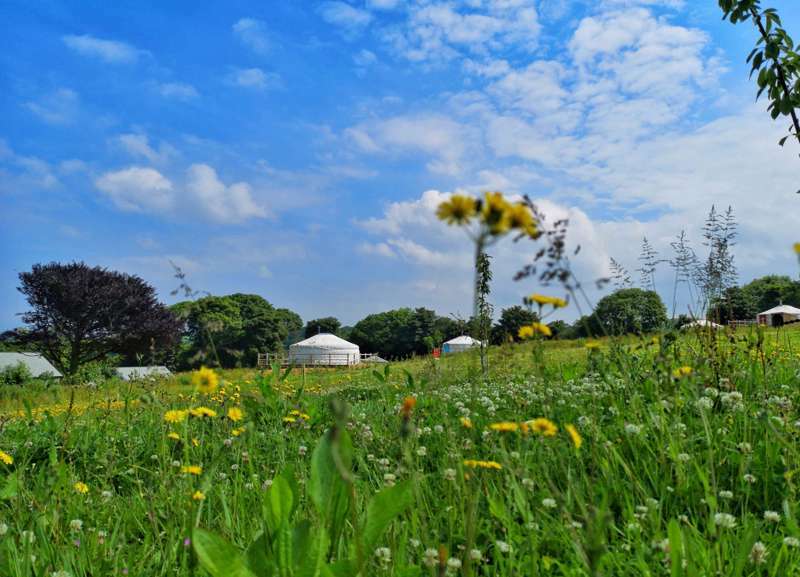 With nine ginormous, Mongolian-inspired yurts, each sleeping up to six people, the site offers privacy and luxury, at the same time as having a real family-friendly buzz during the busy school holiday season. Facilities are all centred around a couple of brand new barns, built on the site of the estate’s old cow shed, with a warm social space (and views of the Porth Reservoir), as well as modern toilets and shower rooms. An outdoor terrace, meanwhile, offers a south-facing space for soaking up the sun with a covered barbecue area alongside. 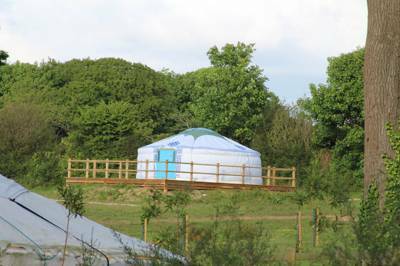 The prime North Cornwall location combined with the luxuriousness of the yurts themselves gives Fir Hill an obvious appeal. But much of the place’s charm is also owed to the ethos. Charlie hasn’t just built a fancy new barn. Instead, the place has been painstakingly restored and renewed with the environment in mind. Water comes from a bore hole, huge solar panels cover part of the cowshed roof and a Froling turbo log boiler allows the site to run off thermal energy when the sun isn’t out. The surroundings, meanwhile, boast a profusion of vibrant flora. Invasive plants such as sycamore, laurel and rhododendron proliferated in the Estate’s ornamental gardens during its derelict years. But since 2012, Charlie and his team have planted over 200 fruit trees in an attempt to restore the abandoned orchards. In all, Fir Hill is part glamping site and part restoration of a place that was long overdue its time in the spotlight. For glampers it is a wonder to explore. Stroll the farm footpaths or drive to the coast, where the vibrant surfer town of Newquay is just three miles away. Bring a board or rent one and take to the waves, build sand castles on the beach or hotfoot along the South West Coast Path to discover quieter coves and wind-blown cliff-top ruins. 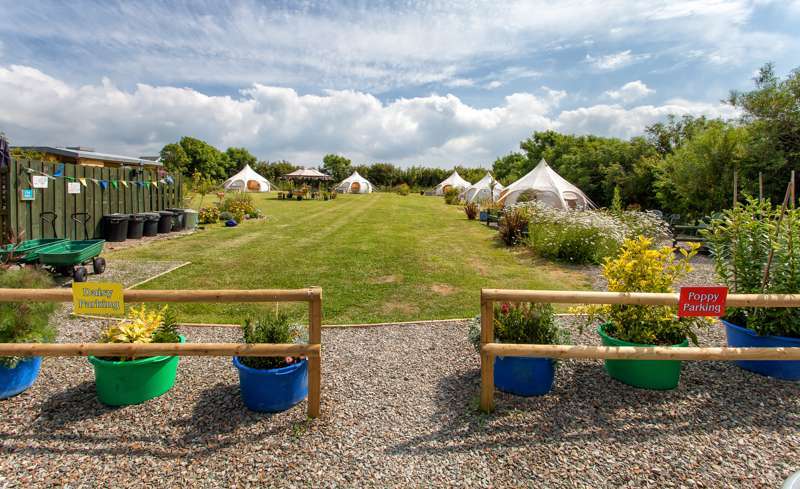 Whatever you do, you’ll find some of the very best attractions in Cornwall are just beyond your yurt-step – a world of adventure awaits on the edge of your own secret garden. As a Glamping site, Real Glamping is unique in that it is totally off-grid. All the lights, WiFi, showers are run from sunlight and logs ! 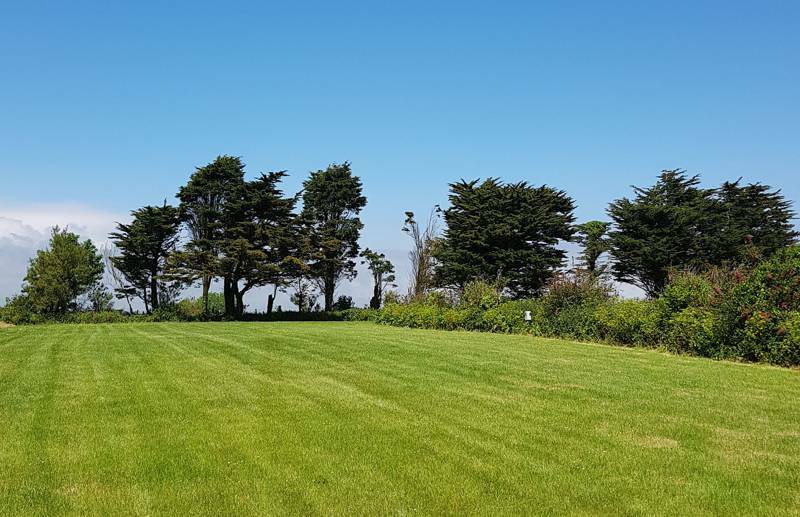 Nestled in the beautiful woodlands surrounding the Porth Reservoir 3 miles from Newquay,with stunning views and 62 acres of historic Estate to explore, this is a total escape from the pressures of 21st century living. Whilst we do provide access to a fast wifi connection, there are various onsite facilities at your disposal which will allow you to enjoy your stay at a slower, more relaxed pace whilst still enjoying the benefits of our amazing leisure areas and contemporary wet rooms. 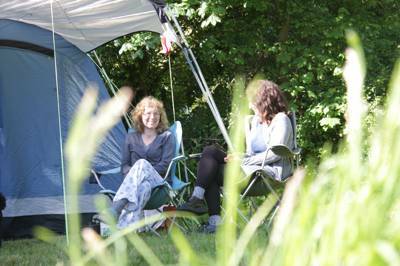 For latest availability and best prices for Real Glamping at the Fir Hill, please use the Date Search above. In the middle of the countryside with all the freshness of camping but with the luxury of staying dry and having hot showers! A great experience of comfortable Yurts with log burning stoves to warm us at night. Really well insulated. Great beach and cliff top walks all within 20/30 mins by car. The showers in the main barn had loads of hot water and communal areas in the second barn were warm and comfortable. Highly recommend it, especially if you are fed up with tripping over guy ropes and and struggling with camping gear. As a first time "Glamper" I found the experience truly delightful. Set on a beautiful, private estate - Charlie has gone to enormous lengths to ensure guests are made to feel welcome and well provided for. 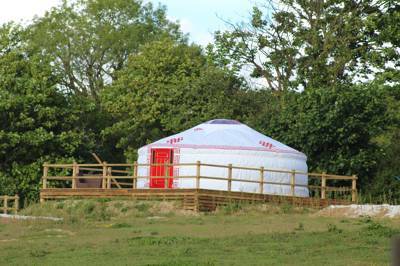 The palatial yurts are literally gale proof and very comfortable indeed. The barn facilities are excellent and the whole enterprise is inspiring in its efforts to be "off grid" and sustainable. Highly recommended for family and friends. The host, Charlie is great fun, so welcoming, knowledgable and made us feel so at home. Very atmospheric, relaxed, laid back and completely private. A unique location for a fun and enjoyable Glamping experience. 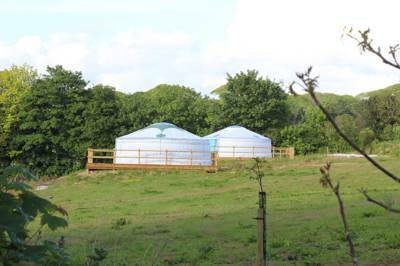 Beautiful yurts with wonderful views and log burning stoves which keep them toastie and cozy. Each yurt has its own bathroom facility and under floor heating - perfect for us New Year visitors. Lovely communal barn with two floors and log burning stoves. We enjoyed both floors for yoga and New Year festivities. Easy drive to glorious beaches, walks, surfing and restaurants. Charlie Hoblyn our host could not have been more accommodating or helpful and even made the dogs feel welcome in our party of 14 people! 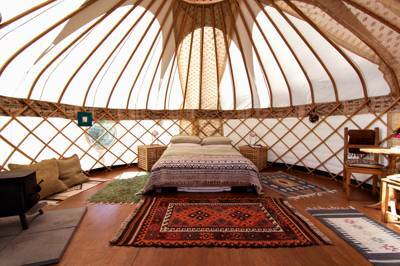 9 luxury yurts, each sleeping up to 6 people. Glamping only. 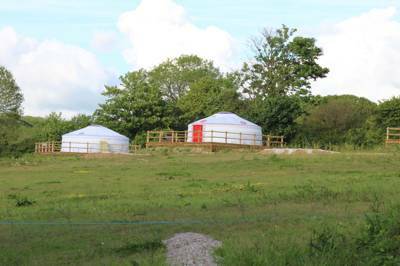 Dogs are permitted in 2 of the yurts (maximum 2 dogs per booking). 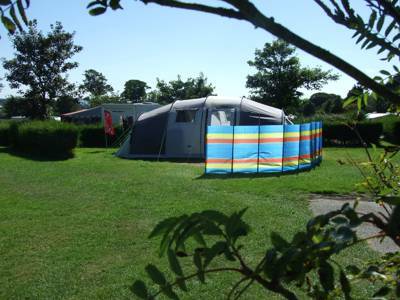 Yurts sleep 6 each, in a king size bed and 2 doubles (all bedding and linen included). Each yurt has its own kitchen shelter, terrace and BBQ facilities, together with a wood supply and fire lighting equipment. Kitchen areas include a gas stove, running water, cool box, pots, pans, tea and coffee making facilities, crockery, cutlery, glasses and all the utensils you need. 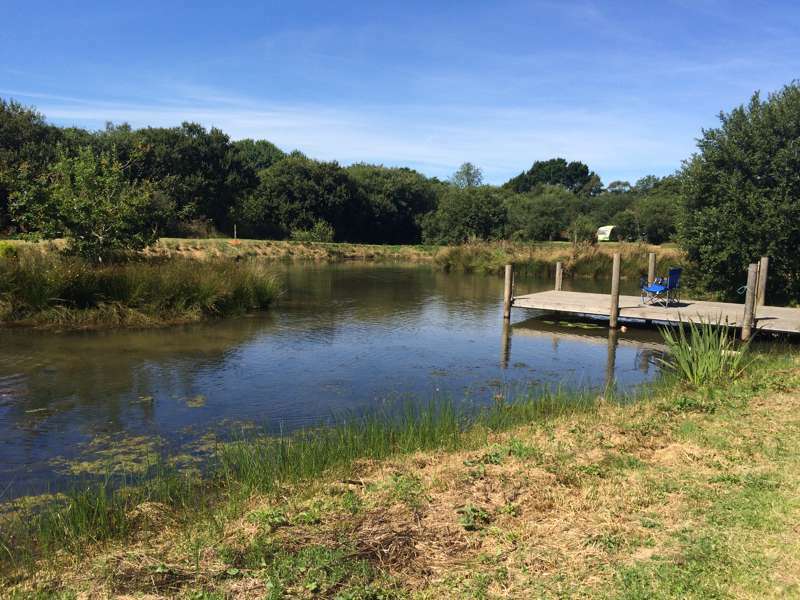 Beautifully converted cowshed housing 8 showers and 8 toilets as well as a large leisure area to relax in. Covered barn area for reading, meditating, yoga or simply enjoying some quiet time. Multiple sun terraces. 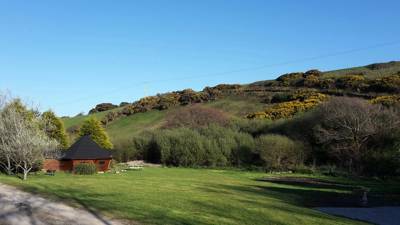 Wifi is available in the area around the barn and cowshed (as well as some of the yurts nearest these buildings). Rinsing water tank for cleaning wetsuits. Television available for children on rainy days. 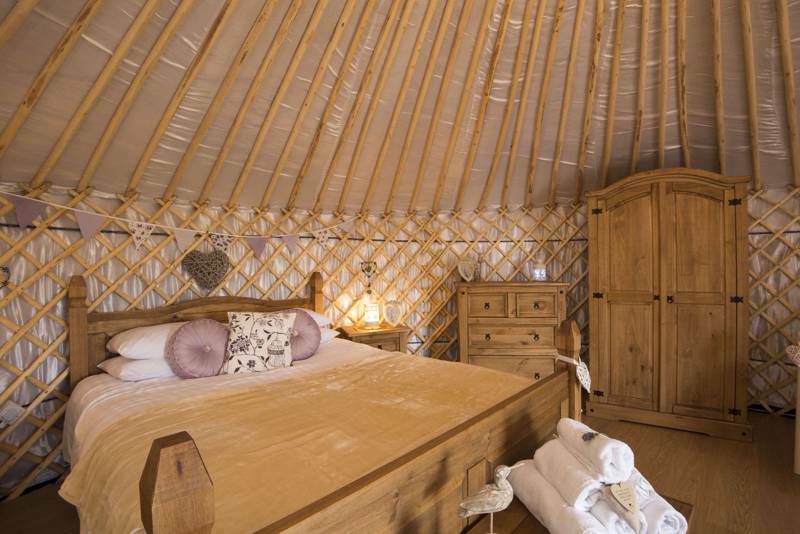 For maximum luxury, book the honeymoon yurt, which also features beautiful wood carvings and has a few extra inches of height. Colan is just 3 miles from Newquay. 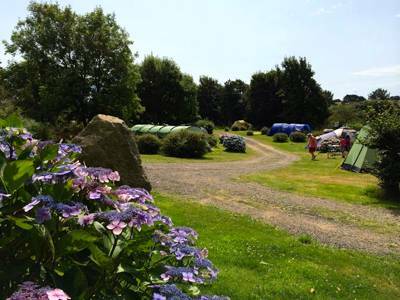 As you approach the glamping site you even get a glimpse of the sea down the Porth Valley – it's the place to head (3 miles) for beautiful beaches, dramatic cliffs and a wander along the South West Coast Path. If you have the energy, use the footpath to get the most out of the coastline, taking in its full undulating scale, from high rocky bluffs to hidden, sandy coves. The quietest beaches are always those only accessible on foot. Try, for example, finding Fox Hole at the far north end of Watergate Bay (follow the grassy track from the main junction in the centre of Trevarrian – opposite Keernow Trek B&B – if you don't want to walk the full mile of up the beach). The vibrant city of Truro, meanwhile, is a short drive away, and definitely worth a visit for its impressive array of independent shops, cosmopolitan restaurants, weekly food markets and striking architecture. The popular family attractions of The Eden Project (01726 811911) and The Lost Gardens of Heligan (01726 845100) can all be reached within 45 minutes (depending on seasonal traffic conditions). By arrangement, BBQs can be organised by the glamping site at their central outdoor kitchen for a fixed price. This is usually only an option for groups of 10 adults or more. Food can be ordered online and delivered to the campsite address. For something more local, though, try a full English breakfast in Bre Pen Farm Shop & Bistro (01673860420), or stock up on lamb-and-mint burgers, from farm-reared, cliff-top flocks, for your campfire feast. For a good pub, try the Falcon Inn (01637 860225), in St Mawgan – a superb, wisteria-clad, 16th-century inn with a lovely garden and good food. Approaching Cornwall from the A30, take the Newquay exit, then take the A392 road to Mountjoy and turn at the sign marked "Colan Church ¾". Head north and pass the church (keeping the graveyard on your right) and after approximately 200m you will find the entrance to the Fir Hill Estate on your right. Drive just under ½-mile until you see the Fir Hill buildings on your right. 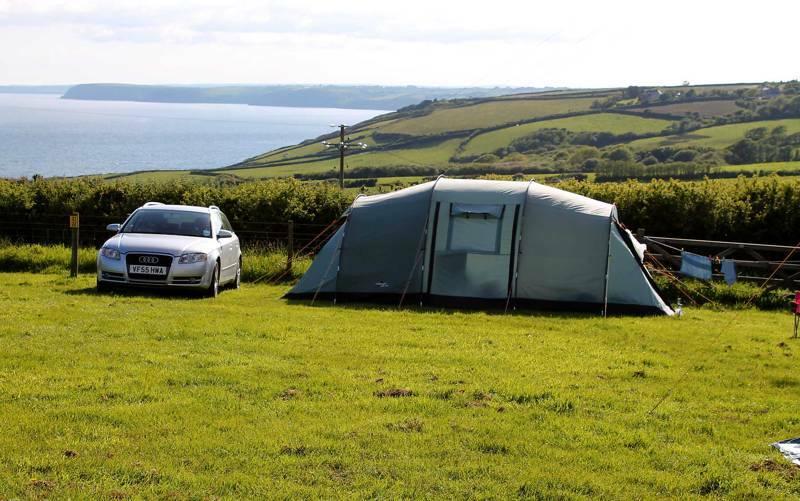 The nearest train station is in Newquay (0845 748 4950), 3 miles away, while Newquay is also home to Cornwall's main airport (01637 860600), which is a convenient 8 miles from the campsite by road.